Offering outstanding fly fishing Half or All Day Trips for beginner to expert levels. 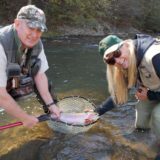 Our Introduction to Fly Fishing trip Half Day Trips are at a mountain trout pond setting and are guaranteed stress free, fun and educational by your instructor John who has 60 years of fishing experience in the local Blue Ribbon trout waters. Equipment provided, lunch provided on our all day trips. Wader rental and lodging available. Group/corporate outings - please call 1-800-882-1145 for rates. Licensed & insured. Open all year by appointment.